In the previous blog we got to know what a Blockchain is, and how you can we create a Java based Blockchain which can not be tampered (Integrity). Blockchain has couple of more design principles other than Integrity : Decentralized, Consensuses, Public Ledger etc. Before we jump to Mining it is important to understand these concepts first. Assume that different participants are adding transactions and blocks to a Blockchain. That means there has to be a central Blockchain that is accessible to all, since all participants needs to add block to the existing Blockchain, This means there has to be a master participants governing and storing the Blockchain. But this is against the principle of Blockchain (Decentralized). There is no master participant in the network. To solve the above issue, each participant keeps a copy of the Blockchain with itself. Once a block is added, it is distributed across the network and all participants update their Blockchain. This concept is called Public Ledger. A ledger (list of transactions) which is public. But this causes another problem in the network. Lets assume that 2 participants are trying to add a block, simultaneously to a Blockchain. Only one can be allowed to do so and the other has to be discarded since the previous hash in that block will be invalid. As seen above only one participant can attach its Block, the other participant has to re-calculate the hash since the blockchain is changed now. But which participant should be allowed to attach the block? The participant who can solve a complex mathematical problem first and submit the proof of work wins. Most of the time the problem is so complex that participants team up to solve it. Now what is the complex calculation ? It is in a certain way the Current Hash of the block needs to be created. In the previous blog we saw how to generate a CurrentHash, it is a combination of Data + Timestamp and Previous Hash. The output can be any aplha-numeric key. The proof of work asks the participants to create hash preceding by certain number of "0"s.
and after some hit-and-try after 4521 hashes he may get his hash which has two "0"s at the beginning. We will represent the integer that is appended to data to generate the hash as nonce. We have added a integer called nonce and it is used in calculating the Currenthash as well. We will also add a method called mineBlock that calculates the required hash based upon the difficulty in the Block class. Here until the desired hash is reached we increment the nonce and use it in the calculation of hash. After every block is created we will call this method to calculate the hash based upon the difficulty set. Here a static variable is used to set the difficulty as 5. And in the addBlock method mineBlock is called before adding the block to the blockchain. Also we are removing the block if it is not a valid one. Here it can be seen that all the hashes in the blocks have five preceding "0"s. Also from the nonce it can be determined how many iterations of hashes were done to get the correct hash result. Mostly a desktop computer can mine with difficulty level up-to 7. Above this difficulty you need a powerful processor, ideally a graphics card. 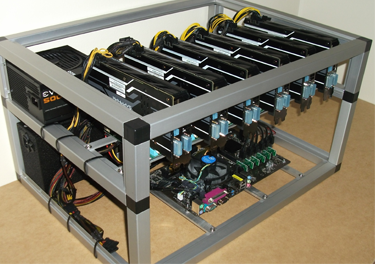 Hence most miners use graphics card and team up with other miners to calculate the hash, since the difficulty level has reached 18. A typical mining machine looks like this. It has around 8-10 graphics cards. Typically the data in a Bitcoin Blockchain is made up of transactions that happens between different participants. A Transaction is made up of the Sender Address, Receiver Address and the Amount transferred. This is how a Transaction and Block class would look.